Our 9-year-old granddaughter was recently diagnosed with juvenile onset (type 1) diabetes, which makes the typical sweet-treat holiday festivities less enjoyable. She is allowed a 15-carb snack a couple of times a day, however, so I got the idea to fill plastic eggs with exactly 15 carbs worth of Easter candy. While it would be unwise and unhealthy to eat candy as a snack on a regular basis, I figured this was a way for her to not be left out and not have to calculate carbs in candy that she might eat. To make these eggs, I bought a variety of Easter candies and did all the calculations to determine how many carbs were in each kind. I then filled a bunch of eggs with exactly 15 carbs worth. I did include some marshmallow candies in a couple of eggs but am afraid they may get sticky so probably would advise against that. It seems best to use candies that are individually wrapped but that isn't how favorites like jellybeans are packaged. So we'll have to take our chances and try to ensure that the plastic eggs don't draw moisture. It was somewhat of a challenge to figure the carbs so better to have it all done ahead of time. 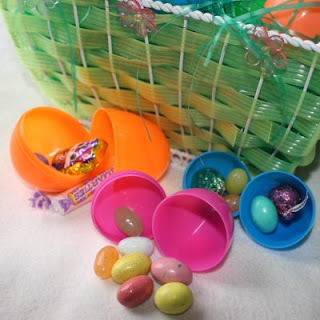 The amount of candy in each egg is rather small but at least none go over the 15-carb limit. What really surprised me is that sugar free jellybeans had the same amount of carbs as regular ones. So don’t assume that sugar free means a diabetic can eat all they want! Hypertension Basics – Who, Why and What? Etsy Update – Back in Business! Another Great Resource for Entrepreneurs!